More often than not, science alone is not enough to bring about change. A message born from scientific research requires emotion and context to cut through to the masses. For our latest research into the illegal timber trade, we wanted to spread far and wide the issue of illegal logging. To do so, we teamed up with local Adelaide artist Andy McIntyre. The illegal timber industry is vicious, causing widespread destruction of wildlife and forests around the world. The industry is estimated to be worth up to $100billion each year. Research led by Professor Andy Lowe and Dr Eleanor Dormontt demonstrated that cutting-edge forensic techniques can be used to trace the origin of the illegally logged timber and hence, catch timber thieves. McIntyre was tasked with creating an artistic interpretation of the illegal logging issue to raise awareness amongst the wider community. 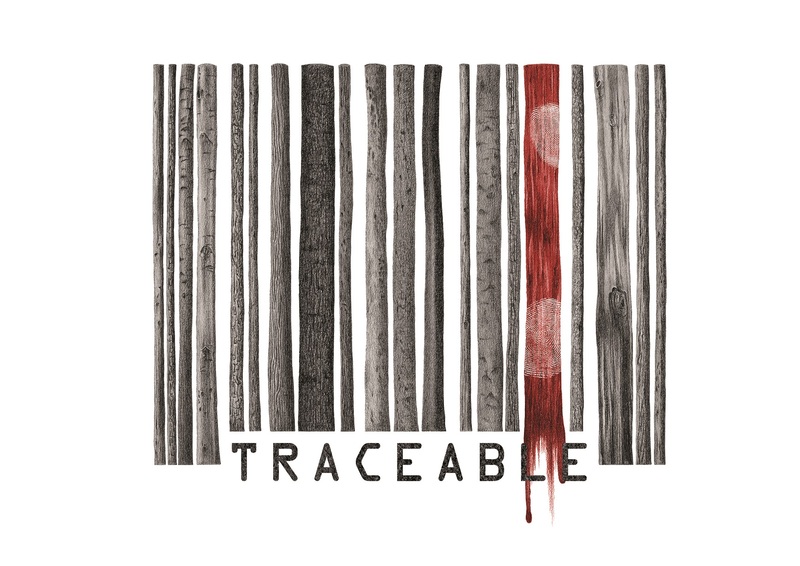 “My very first thought for the illustration was the barcode layout,” says McIntyre, who came up with Traceable, a lead pencil illustration with a splash of digital red. Amidst the black and white of the penciled trunks is a single red-coloured log, a bleeding representation of the illegal timber industry. Two fingerprint marks are impressed on the blood-stained log, a notable nod to the use of forensic techniques to identify and trace the origin of the stolen timber. The task of translating science into a visual message to the masses can sometimes be a challenge. But for McIntyre, that’s not where the true challenge lay. It wasn’t too hard translating this scientific practice into a visual representation. The fact the ‘hero’ of the story – the timber, is something we can all identify, made the connection easier. The hardest part was creating a visual ‘story’ that people would be able to understand without needing a scientific background. We thank Andy McIntyre for his help in communicating the important message to #stopillegallogging. This entry was posted in Conservation Science and Technology, Plant Conservation and tagged Andrew Lowe, Andy McIntyre, Eleanor Dormontt, illegal timber, logging, sciart, stop illegal logging, timber, Traceable, trade. Bookmark the permalink.